Picture the scene: cycling or strolling through lush countryside, the Mediterranean sun hot on your skin, drinking some of the best wine in the world and munching on fresh olives and local cheese. The Via Francigena crosses some of the most prestigious wine regions in the world and we’re here to tell you all about them. Reims which features on section four of the Via Francigena walking from Laon to Reims is the unofficial capital of the Champagne wine-growing region. Cyclists can find Reims on the first section of the Via Francigena cycling from Canterbury to Reims. Undisputedly, Reims is home to the best sparkling wine in the world. The rich champagne grapes of this region have, favourable weather conditions and fertile landscape to thank for their quality. Where better to enjoy a glass of bubbly than in this pristine countryside. 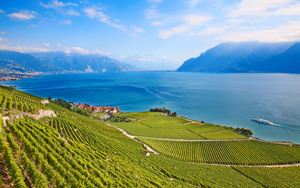 The Via Francigena section nine walking from Lausanne to Aosta takes walkers from picturesque Lake Geneva to the idyllic terraced vineyards of Lavaux, cyclists can choose to cycle section three from Besançon to Lausanne. So picturesque are these vineyards that they have been listed as a UNESCO heritage site and it’s easy to see why. We promise our rosé coloured glasses only play a very tiny part in our enthusiasm over this stunning part of the world! We’ll continue with a ramble through the stunning Piacenza Valley with the surrounding hills renowned for their abundant vineyards. Among some of the most popular varieties in this area are Bonarda, a sparkling red wine. Ortugo a dry white, Malvasia, a sweet white and Gutturnio which is a red wine that can be either still or sparkling. So whether your preference is for red or white, dry or sweet, sparkling or still, in this region alone there is a wine to suit anyone’s taste. To visit the Piacenza Valley you can choose to cycle section eight from Piacenza to Aulla or walk section 12 from Aosta to Piacenza. Section 15 of the Via Francigena walking from Siena to Viterbo passes through none other than the world renowned Val D’Orca wine region, famed for the production of Chianti. 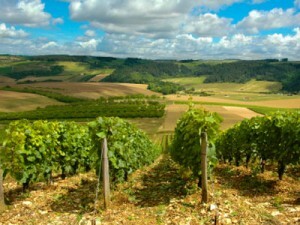 This region is also home of the prestigious Brunello di Mantalcino, one of Italy’s most acclaimed and expensive wines. Brunello translates roughly to little brown one and is the name given locally to an individual grape variety grown in Montalcino and thus the illustrious wine has its name. Seasoned wine buffs might be interested in knowing that in the year 1980 this type of wine was the first to be awarded the “Denominazione di Origone Controllata e Garantita”, a certificate of excellence in the world of wine. For more information about cycling or walking the Via Francigena contact our travel specialists.